It doesn't get more topical then this. 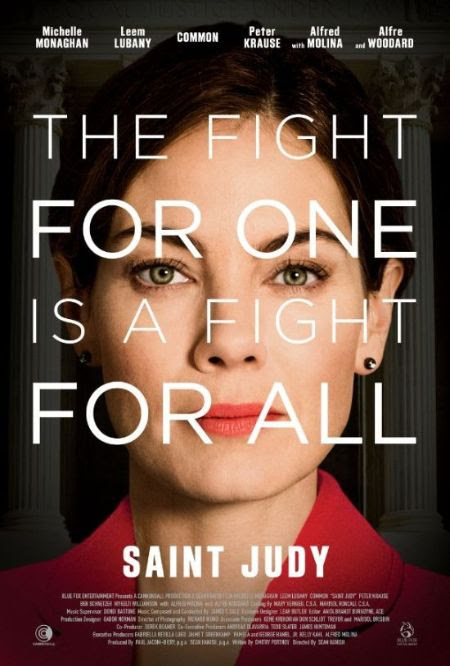 Saint Judy is the true story of Judy Wood, an immigration lawyer from California, and her fight to gain asylum for a woman who was forced to flee her home country from persecution by the Taliban. It's hard to garner much from the trailer other then the obvious "Woman is told she can't, but does anyway in the face of a big bad guy saving someone less fortunate in the process". That sounded a bit callous, I don't mean it to be, but these things do follow a formula, even when based on a true story. I can only hope that the film dives deeper then the surface. Instead of just hitting all of the emotional beats, lets dive into the ridiculous red tape that keeps us from having laws that help those who really need it and stop those who look to harm. It does appear that some of that bureaucracy will be put on blast. I love Michelle Monaghan and am glad to see her getting a shot at something real on the big screen. Plus when you add in Alfre Woodard, who plays a judge....a judge that I would NEVER want to be on the wrong side of. I mean really, Woodard is a classy lady but I'd be terrified to have her as a mom, she has mastered that "you ain't getting away with sh@t" look.